Did you know that you can use an Interactive guide to help set up and learn about your Samsung Galaxy S8 and S8+? 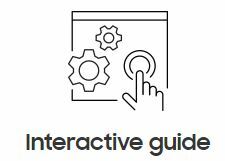 The guide will show you step-by-step simulations to show you how to get started, such as inserting SIM or SD cards, or sending messages or making calls, as well as how to customise your device, add accounts, move files and apps, and make connections. Simply click on the image below to open up the guide.